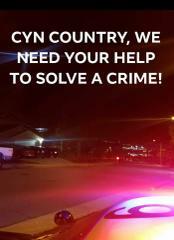 CANYON COUNTRY, WE NEED YOUR HELP IN SOLVING A CRIME! **WE NEED YOUR HELP TO SOLVE A CRIME** A residential burglary occurred in Canyon Country on May Way at approximately 5:30 p.m. on Friday, January 18, 2019. An elderly couple arrived home to find two suspects inside their residence. As Santa Clarita Valley Sheriff's Station was notified, the suspects fled on foot from the location. Responding deputies set up a containment in the area in hopes of finding them Unfortunately, they were unable to locate the alleged perpetrators, and the containment was lifted at 10:15 p.m.
Detectives would like to hear from ANYONE who has any information about the incident or suspects. Some residents reportedly had brief contact with the suspects as they tried to escape through their backyards. If you saw something, talked to the suspects, WE WANT TO HEAR FROM YOU. Also, if you have SURVEILLANCE CAMERA FOOTAGE that possibly captured the suspect(s) that night, we would love to take a look at it. We are actively investigating this incident, and we want to catch these two suspects so that they do not victimize anybody else! SUSPECT 1: MALE, APPROX. 18-25 YEARS OLD, WEARING DARK CLOTHING. SUSPECT 2: MALE, APPROX. 18-25 YEARS OLD, WEARING WHITE OR LIGHT GREY CLOTHING. If you have information, please call Santa Clarita Valley Sheriff's Station COBRA detectives at: (661) 799-2318. Anonymous tips about the identity of the suspects can also be relayed through www.LACrimeStoppers.org, or by calling 1-800-222-8477.